Read the Bible and the TRUTH Will Set You FREE! I was a Spiritual Hostage for 43 years as a practicing and non-practicing Jehovah's Witness. During this time, I struggled with the harsh judgments from my JW family and members of the congregation. No matter how hard I tried, it was never enough. 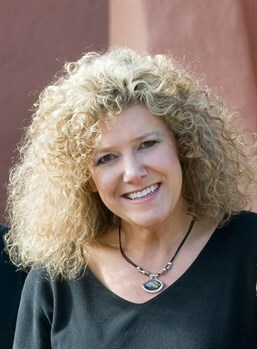 Even when I was doing everything expected of me, a fellow sister in my congregation and wife of a ministerial servant told others that I was "bad association". I crumbled under the judgments and know others are struggling with similar situations. After being hurt one last time, I stopped practicing my religion and simply prayed to God and read the Bible. And, that is what led to my eventual spiritual freedom. Simply praying and reading the Bible is the best way to learn the TRUTH that will set you FREE. 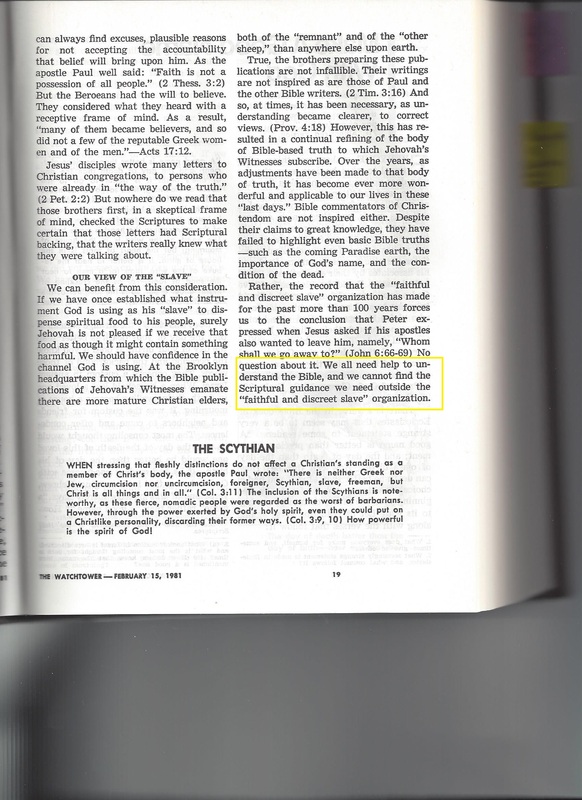 The Watchtower Bible and Tract Society would have their followers believe otherwise. NOTE - 2 Timothy 3:15-17 says the scriptures alone are enough to make one wise unto salvation. 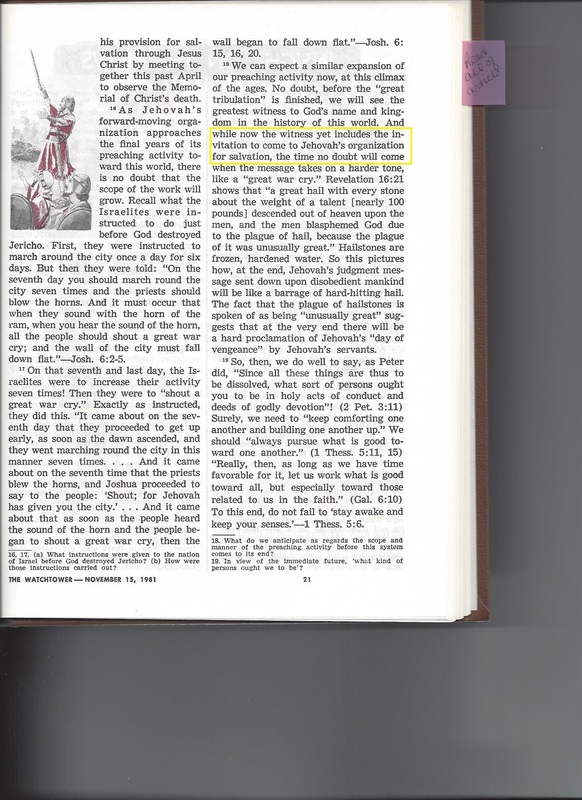 And, why does the Watchtower Bible and Tract Society believe the Bible needs to be interpretted? Are we not to read it in the literal context? Yes, but the Watchtower Bible and Tract Society will interpret scripture for it followers - that is why their followers need their Watchtower publications to explain their Bible interpretations. 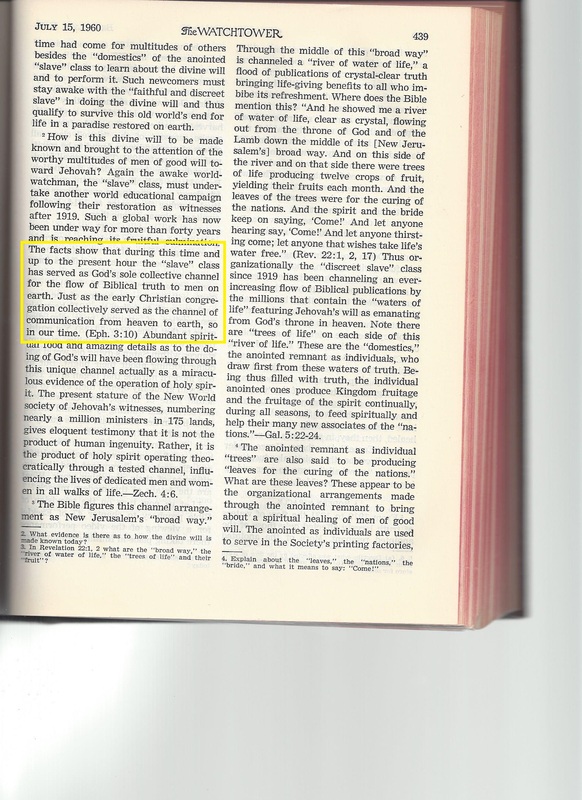 Additionally, as a Jehovah's Witness one feels like a spiritual hostage because you have been trained to believe that God chose the Watchtower Bible and Tract Society as his sole earthly organization to communicate the true meaning of the Bible. And, that salvation is only through their organization. 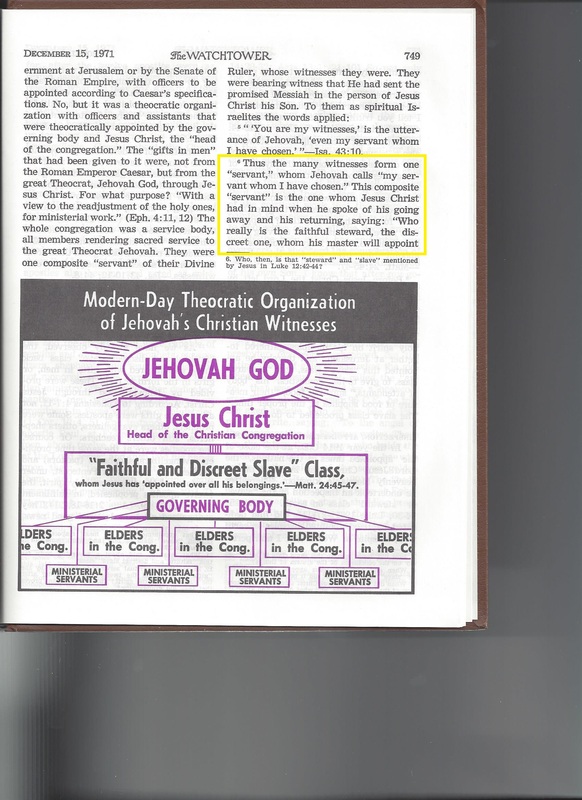 The Watchtower, November 15, 1981 went so far as to show an organization chart. You are also told to never read anything other than the Watchtower Bible and Tract Society publications. One feels trapped and afraid to ever question anything. According to the scriptures, the Bible alone should be enough to understand what God intended us to know. "All Scripture is inspired of God and beneficial for teaching, for reproving, for setting things straight, for disciplining in righteousness, that the man of God may be fully competent, completely equipped for every good work." Notice the phrase, "completely equipped". No, you needn't have anything other than the Bible to understand the scriptures. There is no need to add books and "modern-day prophets". I struggled my entire life with the concept of there being only one true religion. I was held hostage to my religion until I gained spiritual freedom by simply praying and reading the Bible. Spiritual Hostages is a website intended to assist struggling Jehovah's Witnesses, and for that matter anyone in any religion who feels held hostage or thinks that their religion's doctrines don't add up. Does the Bible say there is only one true religion? 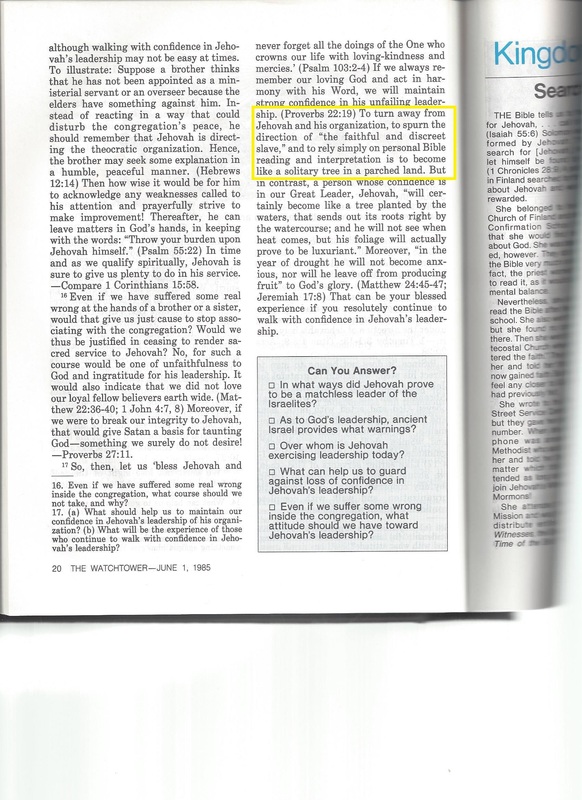 No, but Jehovah's Witnesses have been taught that there is only one true religion, citing Ephesians 4:5, 6 (NWT) "one Lord, one faith, one baptism; one God and Father of all [persons], who is over all and through all and in all." However, looking at the definition of "faith" in the Bible at Hebrews 11:1 it tells us that "faith" is not an organized religion. Read more. Where in the Bible does it say salvation is through one organized religion? Salvation is contingent on us believeing in and having faith that Jesus is our Savior. It is not owing to works (Ephesians 2:8, 9). Also see, 2 Timothy 3:15, Romans 6:23, Acts 16:30, John 6:28, 29, John 5:24. Nowhere in the Bible does it say the way to salvation is through an organized religion, their rules and the works they prescribe. Read more. I am not a Bible scholar and I have no formal training. I simply have the knowledge from being born and raised in a strict Jehovah's Witness home and studies of the scriptures, both as a Jehovah's Witness and now as a born-again Christian. 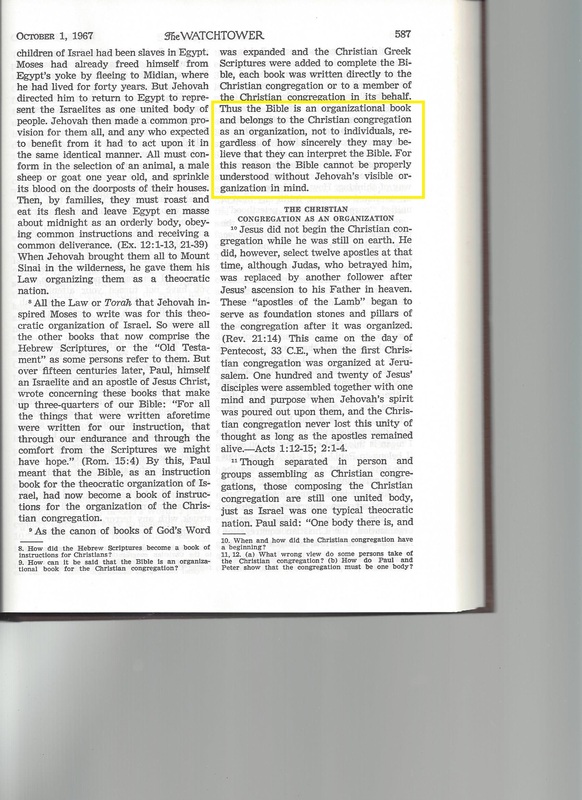 The New World Translation (NWT) from the Watchtower Bible and Tract Society is quoted in most cases. If you are a struggling Jehovah's Witness, you can use your own Bible to find the truth to set you free. If you have a loved one who is a Jehovah's Witness, and need to be knowledgeable on how to ask them questions and/or respond to them, using their bible is best. After all, they will tell you their bible is the most accurate. If you have a specific questions, please contact us.